Why do plant diseases matter? 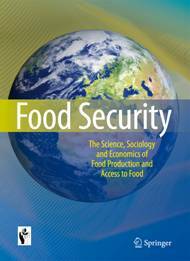 Food Security: The Science, Sociology and Economics of Food Production and Access to Food. Already have a Membership Package? Click here to download or read online. Login required. Global Food Security: background to the journal. Aims and scope: beyond plant pathology, beyond plants, beyond agriculture .. In areas of the world where incomes are low, the provision of adequate food for human consumption is far from secure. As a result, malnutrition still claims the lives of many, particularly the most vulnerable � 18,000 children every day according to one estimate. This is an appalling tragedy in the true sense of the word, as such misery is avoidable: but avoidance is seldom simple, as the scope of this journal demonstrates. The journal is the initiative of a distinguished international group of scientists, sociologists and economists who hold a deep concern for the challenge of global food security, together with a vision of the power of shared knowledge as a means of addressing that challenge. They form the journal's Advisory Board. This initiative is coordinated by ISPP and had its origins in a public forum at ICPP98 in Edinburgh, addressed by Nobel Peace Laureate, Dr Norman Borlaug. This resulted in the formation of ISPP's Task Force on Global Food Security. From discussions by the Task Force emerged the concept of a food security journal, shaped under the influence of the Advisory Board, as announced in the ISPP Newsletter in July 2007. The journal is owned in equal shares by ISPP and Springer. It will appear quarterly from the first quarter of 2009, in electronic and printed formats. The journal will be included in the lists of Springer journals available through Springer Developing Countries Initiatives such as AGORA, HINARI and OARE. Members of ISPP and of its Associated Societies will be able to access the journal online at a cost of $45 US Dollars per calendar year, including individual Membership of ISPP. "I said in 2005 that we will have to double the world food supply by 2050. Meanwhile the term food security has passed into ordinary vocabulary. In recent months, hardly a day passes without the media focusing on the availability of food, the price of food, food safety and so on, in a global context. It is therefore particularly timely that ISPP and Springer are launching, as a joint venture, this journal with its topical title and with the breadth of coverage indicated by its subtitle". To address the challenge of global food security, the journal seeks to address the constraints - physical, biological and socio-economic - which not only limit food production but also the ability of people to access a healthy diet. The journal contains a mixture of original refereed papers taking a synthetic view of the science, sociology and economics of food production, agricultural development, access to food, and nutrition, together with review articles, case studies and letters to the editor. The journal covers the principles and practice of food security per se, taking an overview of the subject or analysing it with a broad perspective over its many component disciplines. The journal does not seek to duplicate the coverage of the many publications that focus specifically on those component disciplines. Thus Food Security includes reference to plant pathology, for example, but extends far beyond plants and indeed far beyond agriculture. There is no particular focus on plant pathology. Manuscripts should be submitted to www.editorialmanager.com/FOSE/. For full details on the preparation of manuscripts please refer to the Instructions to Authors also available on the website.